This high-protein Health Nut Smoothie Bowl with banana, almond butter and protein powder is a great breakfast to start your day. It’s also a great post-workout recovery meal. I recently enjoyed a similar version for breakfast at Nü (New) Health Food Café in Sea Point, Capetown. I loved it so much that I have tried to recreate it at home with a few twists of my own. The taste reminds me of the thick and creamy cake batter my mum just to make when I was a kid. She would allow me to lick out the bowl. While I was making my smoothie, I noticed I was doing just doing just that with my blender. I was scraping every single little bit out of my blender, because I loved it so much. I like to make my Health Nut Smoothie Bowl extra thick, but you can always add more water, if desired. You can add any topping you like. I like to load mine with fresh fruit like blueberries, figs, pomegranate or raspberries and high-protein superfoods like chia, hemp and puffed amaranth. Add anything you like, that’s the best part of making your own smoothie bowl! Blend all smoothie ingredients in a high-speed blender. Scrape blender as required. Add more water if required. I like my smoothie thick and creamy but you can always add more water, if desired. Add smoothie ingredients to a breakfast bowl. 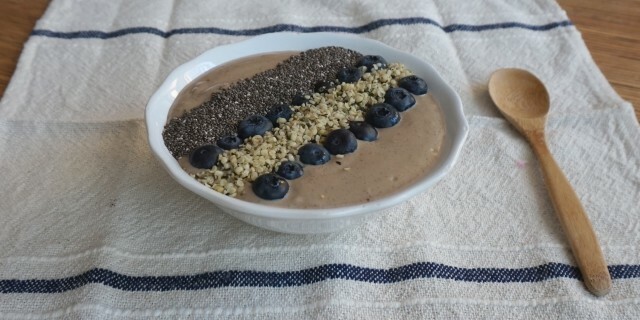 Top with your favorite toppings above and enjoy your Health Nut Smoothie Bowl!